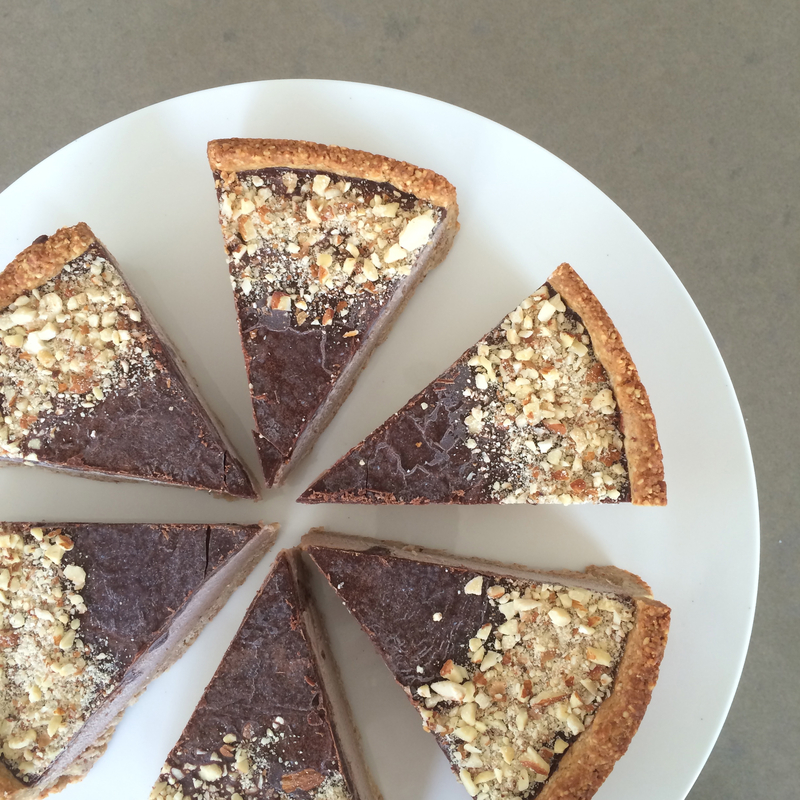 Salted Caramel Tart – Gluten and Dairy free and paleo friendly | Hey Bernice! I had a problem. I was entertaining guests, was on a strict Paleo diet and wanted to make a dessert that they were going to talk about (and not realise was gluten free, dairy free and refined sugar free) – tough ask huh? It was until I stumbled across this amazing recipe by the Merry Maker Sisters (my new sister idols!- go girls!). You can probably guess that it was a hit, or I wouldn’t be writing about it now. Trust me there are many recipes that have joined the ‘never to be seen on Hey Bernice’ list! I can guarantee you and your non-Paleo friends will love this. As always I have altered some parts of the recipe. I have posted my favourite version (after trying it many times). You can also choose to make individual tarts (it makes it so much easier when you don’t have to cut the tart and try to keep it looking good!). 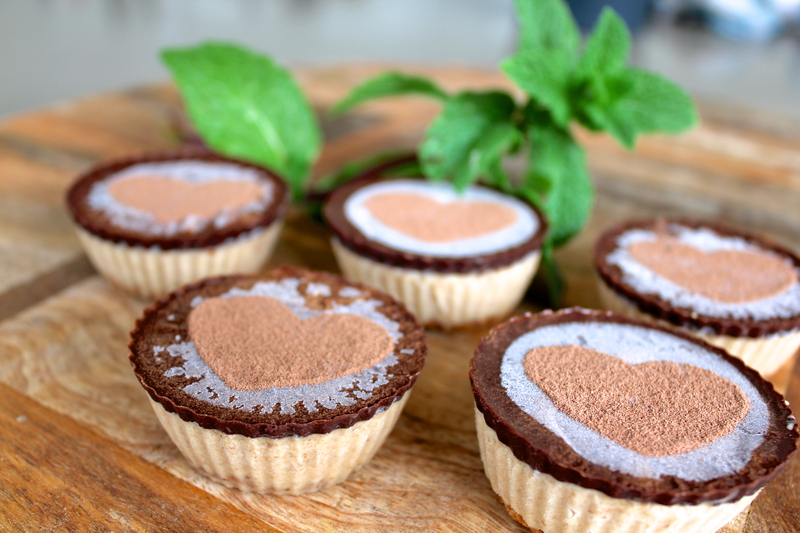 I use silicon cupcake moulds – guaranteed to come out easily! Preheat oven to 180 °C/ 355 °F. Grease a 22cm tart tin. Place 1 cup of the hazelnuts in a food processor (or Thermomix). Reserve 2-3 tablespoons for later. Grind and process into fine meal. Add the almond meal, coconut oil, egg, maple syrup and vanilla. Mix again until the mixture comes together. Scoop the mixture out and make it into a large ball. Place and flatten between 2 sheets of baking paper (about 50x50cm). With a rolling pin, roll out the base to about 3mm thick. When rolling, start from the middle and roll to the edges in different directions. Peel the top layer of baking paper off, then flip the base over the tart tin. If your base breaks a little just fill in any gaps with your fingers. Make sure the area where the sides and the base meet is a little thicker if possible. Place a round layer of baking paper over the base and fill with baking beads. Bake in the oven for 10 minutes, remove the baking beads and bake for a further 10 minutes or until golden brown. I turned the oven to 170°C for the second 10 minutes. Set aside to cool, in the tin. Now for the filling. Drain the water from the soaked dates (don’t try to use regular dates for this – it simply doesn’t work as well – trust me I tried!). In the food processor, whiz the dates, coconut oil and vanilla until they form a thick paste. Add the coconut cream or milk and salt, whiz again until really smooth (about a minute, scrapping the sides as you go). Spread the caramel mixture over the base and place in the freezer for about 20-30 minutes. You can sprinkle the crushed hazelnuts over the base before adding the caramel or sprinkle on top of the chocolate layer. Now for the chocolate topping. In a double boiler (a bowl placed over simmering water worked well for me), melt the coconut oil, honey and vanilla. Stir until combined. Sift in the the raw cacao powder and whisk continuously until smooth. About 20-30 seconds, you don’t want to overcook it. Pour the chocolate topping over the caramel and spread with a spatula. Sprinkle with crushed hazelnuts. Place in the freezer for 5 minutes. Slice and serve with whatever you like – If it is a hot day you might like to serve straight from the freezer to ensure the caramel keeps its form.